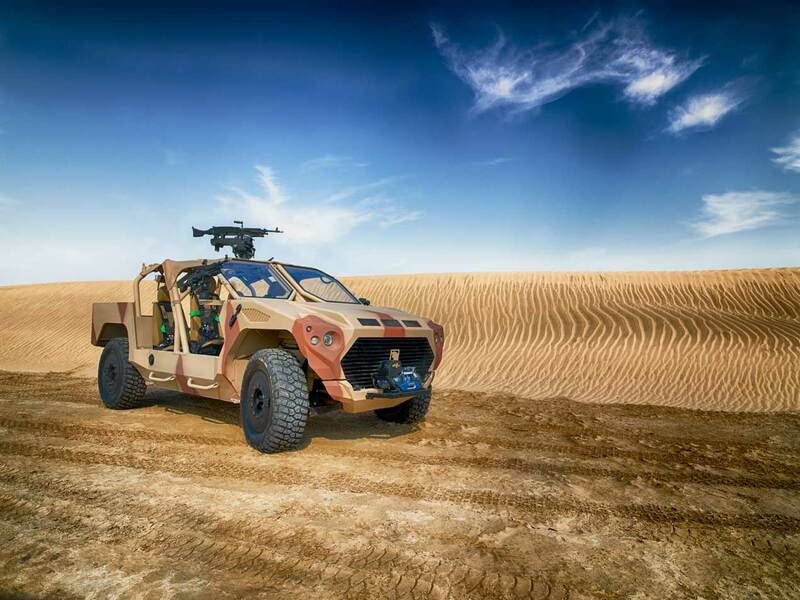 The Rapid Intervention Vehicle is designed to withstand the harsh conditions of the Arabian desert, but could appeal to European and Asian buyers. 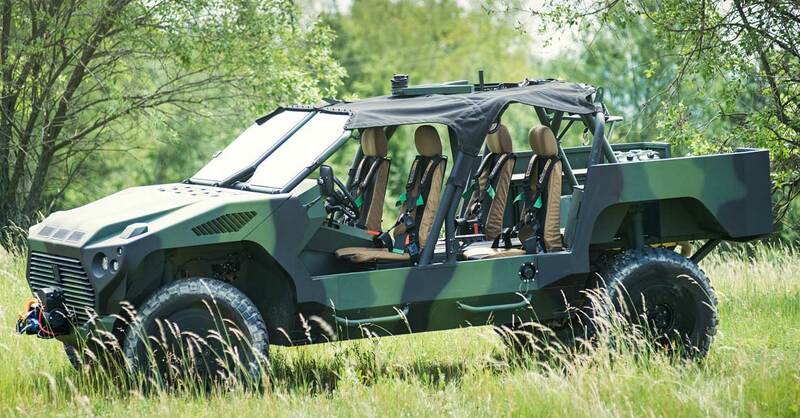 UAE-based wheeled military vehicle manufacturer NIMR may not be the first name that springs to mind if you’re contemplating buying an all-terrain, highly mobile vehicle for rapid insertion of Special Forces. NIMR, which is 60% owned by the Abu Dhabi-based investment fund Tawazun, is largely known for the design, manufacture and support of larger, heavier wheeled, armoured military vehicles. But back in 2015, it identified a trend in the market for a highly mobile vehicle in a smaller size and weight class that could be easily transported (by land or air), perform on and off road and in extreme temperatures. UK-based HORIBA MIRA, which collaborated with NIMR on the project, was given just 12 months to design, engineer and test such a vehicle. The product of their fruitful collaboration is the Rapid Intervention Vehicle, or RIV, which was previewed at IDEX back in February. What appears to set the RIV apart from other vehicles in this class is its off-road capabilities and ability to withstand the terrain (hard and soft sand) and extreme conditions (temperatures can reach up to 54 degrees centigrade) of the Arabian desert. UAE Armed Forces recently spent a week in the desert, in the searing August heat, testing the RIV to “breaking point.” This week-long exercise is thought to be one of the most difficult tests for vehicles in the world. Ahead of that test, NIMR invited a group of defence journalists from the UK and the US to the Arabian desert, to witness the RIV being put through its paces. You can watch our desert experience in the video below. Designing a vehicle to withstand such austere conditions may give NIMR an upper hand against competitors in this class of vehicle, which include General Dynamics Ordnance and Tactical Systems, which developed, amongst other vehicles, the GMV 1.1 all-terrain vehicle for use by US Special Operations Forces (SOF). Other competitors in the SOF vehicle space are Polaris, which specialises in all-terrain vehicles, snow mobiles and quad bikes, which are modified for military use. NIMR’s RIV, which is 4.89 metres in length, 2 m wide, 1.81 m high, with a wheelbase of 3.25 m, a gross weight of 4,000 kg and can carry a payload of 1,500 kg, can be deployed either by land-based vehicles or a CH-47 Chinook twin-engine heavy-lift helicopter, internally or as an underslung load. It has a cruising range of 1,000 km (621 miles) at 120 mph with a 300 hp diesel engine for high acceleration: The RIV can reportedly attain a speed of 100km/h in less than 11 seconds. Optional equipment includes a central tyre inflation system that enables tyre pressure to be adjusted on the go for different terrains, run flat inserts and a self-recovery winch. The RIV can be armed with up to a 12.7 mm machine gun. The payload can be increased according to customer requirements. NIMR also developed the Long Range Special Operations Vehicle or LRSOV, which can carry a heavier payload than the RIV. Although it is an open top vehicle, the RIV’s greatest level of protection comes from its high-speed response. Traditional forms of protection such as under-body blast protection come as standard and applique armour kits for ballistic protection are optional. “NIMR has experienced tremendous growth over the last four years since Tawazun took control of the company,” says Wilks. NIMR’s new 37,500 square metre production facility at Al Ajban in Abu Dhabi is the largest military vehicle manufacturing facility in the region and can produce up to five vehicles a day in a single shift. It also boasts its own test track. NIMR has also managed to attract local and international talent and leading experts in their field, which perhaps explains the collaboration with the likes of the UK’s MIRA, which has provided vehicle engineering solutions to the military and commercial sectors since 1946. The UAE-based armoured vehicle manufacturer has traditionally served the UAE and African markets, but is now focused on expanding internationally. In February this year, NIMR Automotive and the Czech Republic’s VOP CZ, signed a Strategic Collaboration Agreement for the marketing, distribution, production and after-sales support of the complete range of NIMR armoured vehicles to the Visegrad Four countries – the Czech Republic, Poland, Slovakia and Hungary. NIMR and VOP CZ plan on producing more than 1,000 vehicles in the next three to five years, exceeding a value of more than US$500 million. VOP CZ, which produces armoured cabins for NIMR’s Ajban 440A, has produced “winterised” versions of the Ajban and the RIV. Miles Chambers, senior international business development and sales manager at NIMR, says Central and Eastern European countries haven’t invested in armoured vehicle capabilities for some time, but are now looking to move away from commercial platforms to truly militarised platforms, which NIMR sees as an opportunity to expand its customer base beyond the UAE and Africa. “The Netherlands is also phasing out the Land Rover Defender and are looking to replace it with more militarised vehicles,” says Chambers. They are looking at both armoured and soft skin vehicles, and something in the class of NIMR’s RIV. He also sees potential demand for the RIV coming out of Southeast Asia, with countries like the Philippines, having to contend with a growing threat from terrorist groups such as Islamic State (Daesh).